You’ve got to be willing to destroy those windows of the glass house in order to have the awareness of what kind of aging you either have to have or you don’t have to have. It’s just a choice. Have you ever noticed that as glass reflects, when you look at a glass house, most of the time, if you’re not at exactly the right angle, you can’t see in, you can only see the reflection of yourself or a reflection of the outside world? What creates the aging is the same thing. The reflection of the rest of the world is what creates your aging. 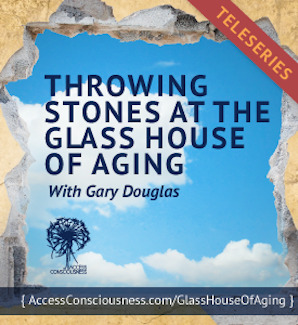 So you’ve got to be willing to destroy those windows of the glass house in order to have the awareness of what kind of aging you either have to have. or you don’t have to have. It’s just a choice. There are a total of 6 calls in this series.